Do you ever find yourself wanting to buy everything you see on social media? It's really hard to stay focused on what you need versus just what you want and get click happy and buy all the cute clothes, amiright? 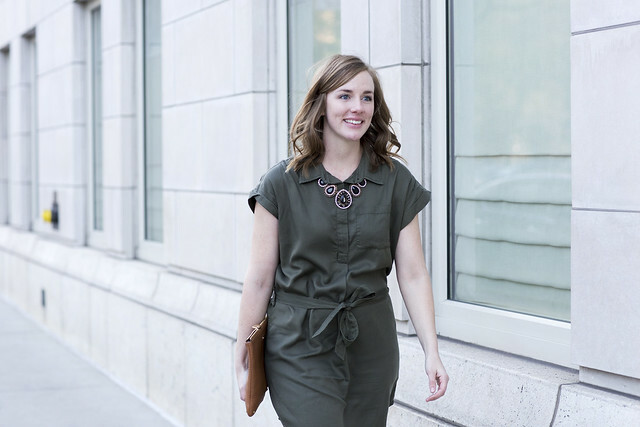 As much as I try not to impulse buy things when I see them on Instagram, I spotted this khaki shirt dress (which also happened to be an item on my current list of essentials) and because the price was so great, I felt just fine scooping it right up. So far it's been perfect for spring although I think the verdict is still out about how office appropriate it is the way I styled it here (that side detail makes me a little nervous sometimes...). But with a sunhat and my favorite Nike's for weekend adventures? It's perfect.